Mackay, a PhD candidate working with the School of Humanities and Social Science and Tudor historian, has also been invited to undertake a talking tour of the United Kingdom during May. She is an historian whose focus of study goes beyond familiar historical figures and events to lesser known individuals; as well as beliefs, customs, and diplomacy of the 16th Century. In addition to her recent book release, Mackay is currently researching her PhD with the University of Newcastle on Thomas and George Boleyn in the English Reformation . 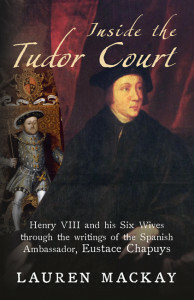 Mackay's book is the first full-length biography of a key player at the Tudor Court, and the first book to use his perspective to discuss the Tudor Court and Henry VIII's relationships. She has uncovered and studied Chapuys' original letters, and never-before-seen portraits. "The book will be launched both locally in Australia and internationally. The first launch will be held in Sydney on 3 May at Gleebooks and another launch will be held in London on 9 May. Renowned Tudor historian, Alison Weir has graciously agreed to launch the book," Mackay said. She will also undertake a tour of the UK where she has been invited to speak about her PhD research on the Boleyn men of the Tudor Court as well as her book. She will host talks at various well-known UK venues including Hever Castle, Leeds Castle, National Archives and the Peterborough Heritage Festival. "The highlight of the tour will be a talk I'm giving at the Tower of London. I'm one of three Tudor historians invited to speak there in May for the anniversary of Anne Boleyn's death. I'm really excited to have been asked to speak at such an amazing venue and vividly bring to life Anne Boleyn's life from coronation to brutal execution," Mackay said. Mackay was recently featured with a cover article in BBC History Magazine - the first to feature Chapuys.